I’ve been actively studying flute performance since I was in the fourth grade, and am currently playing in a few ensembles and an orchestra. Actually, that’s the main reason why I’ve been slower to post lately; I’m rehearsing from nine in the morning until five. I also play the piano (but not well). I pretty much can’t survive without music. I wrote my first “novel” (quotes because at the time, I thought it was the single greatest work of literature in existence) when I was eight. It was seventy-five handwritten pages and about a dog who snuck to school in his owner’s backpack. First rate stuff, right there. I have a 130 lb Bernese Mountain Dog named Luna, and three hermit crabs named Armando, Philomena, and Seamus. I used to have three turtles (Giovanna, Luigi, and Luciana) and two snakes, and to this day turtles remain my favorite animals. I’m about half Italian, and whenever my dad’s side of the family gets together, we make the most delicious strombolis and pizzas from scratch. My favorite dish would have to be baked zidi, though. I’ve recently fallen into a cooking and baking kick. I’m trying to learn French, because I think it would be so cool to be bilingual. I’ve been taking lessons for about two years. Though I have an infinite amount of respect for the independent publishing industry, it’s always been my dream to have a book published traditionally. You know; the agent, the editor, the whole shebang. 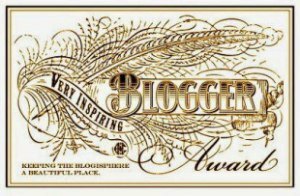 To the nominated blogs: please don’t feel obligated to complete every step exactly; I just wanted to give you some recognition for being amazing. Thank you again to Sarah of The Lit Bear for nominating me, and thanks to all of the above blogs for being awesome!